Mother Nature has treated us kindly the past month. We had some colder than normal days, but the days have been limited. Let’s all hope that February is the same. Not much will change from last month as long as the weather stays normal. Trout and Sheepshead will highlight Tampa fishing charters this month. The power plant will play a big roll if temperatures drop. Trout will still be the headline for Tampa fishing charters this month. Season will remain open with a limit of 4 per angler, 15”-20” with one allowed over 20”. Fish the deeper grass flats around Joe Island and Cockroach Bay. Also try the many residential canals from Little Manatee to Apollo Beach. A live shrimp under a cork will be hard to beat. When fishing the flats, I use 18” of 25lb Berkley fluorocarbon leader with a #1 Daiichi circle hook under a cork. When fishing around docks, try using a split shot to keep the bait on the bottom. The sheepshead bite was good last month and will continue to get better this month. While they prepare to spawn, they will be more willing to bite. Fish will hold around most rock piles, reefs, ledges, and docks. Shrimp are my bait of choice just because they are easy to get. Fiddler crabs and green mussel will also work great. A split shot or jig head will get the bait into the strike zone. Be quick because sheepshead are known to be thieves. There is a minimum length of 12” and a bag limit of 15. It’s probably not the best time of year to fish redfish but there are still some fish to be caught. There won’t be the big schools roaming the flats, but there will be singles hanging in potholes. Joe Island is a good place to start. The area has plenty of grass flats with potholes. With the tides not getting very high, these fish will hold in potholes that may be only a few inches deeper than the surrounding flats. Work as many potholes as you can and you will be sure to score a few slot fish. 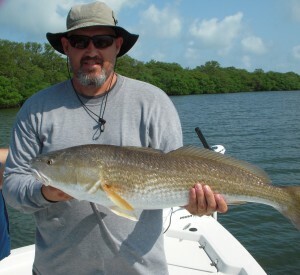 The Alafia and Little Manatee River will have plenty of Rat Reds. They are great for kids and when you find one, others will soon follow. If temperatures get cold, look for the Apollo Beach power plant to hold fish. The power plant uses the bay’s cold water to cool their systems and discharges warm water. The water around the outflow is around 75 degrees. This warm water attracts almost everything that swims…Snook, redfish, trout, cobia, sharks, permit, pompano, jacks and the list goes on. Be sure to obey the manatee zones and the no entry zones. The FWC does patrol the area and will issue tickets. Be safe and catch’em up.